On the first day of Unleavened Bread, when the Passover lamb was sacrificed, the disciples said to Jesus, ‘Where do you want us to go and make the preparations for the Passover?’ So Jesus sent two of his disciples, saying to them, ‘Go into the city, and a man carrying a jar of water will meet you; follow him and wherever he enters, say to the owner of the house, “Where is the guest room where I may eat the Passover with my disciples?” He will show you a large room upstairs furnished and ready. Make preparations for us there.’ So the disciples set out and went to the city, and found everything as he had told them; and they prepared the Passover meal. 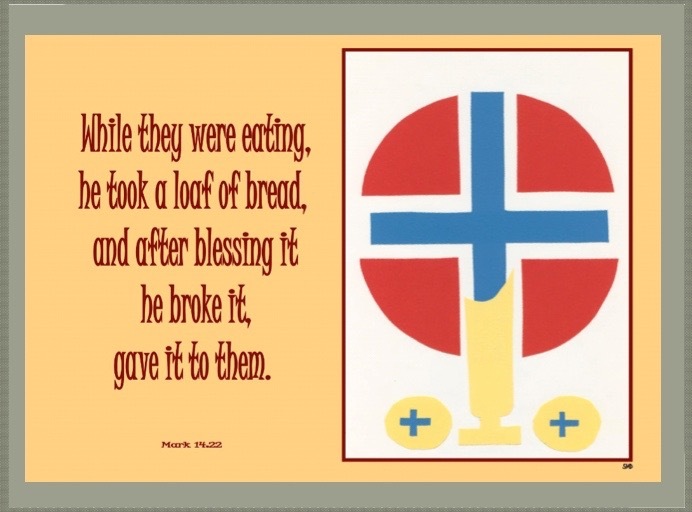 While they were eating, Jesus took a loaf of bread, and after blessing it, he broke it, gave it to them and said, ‘Take, this is my body.’ Then he took a cup, and after giving thanks he gave it to them, and all of them drank from it. He said to them, ‘This is my blood of the covenant, which is poured out for many. Truly I tell you, I will never again drink of the fruit of the vine until that day when I drink it new in the kingdom of God.’ When they had sung the hymn, they went out to the Mount of Olives. All that the Lord has spoken we will do, and we will be obedient. See the blood of the covenant that the Lord has made with you. Take; this is my body. This is my blood of the covenant which is poured out for you and for many. This brings to fulfilment the ritual that Moses enacted with the Israelites. Here the blood, signifying life, is the blood of Jesus himself. In this way the final covenant is forged between God and his people. For many centuries the wine of the Eucharist was never given to the people; many of us would remember those times. One of the most significant changes made in the revision of the mass is to make the chalice again available to the congregation. Our reception of the Eucharist is made complete when we have both the bread and the wine. As we drink the wine we should be conscious of the blood that Jesus poured out for us, sealing a new covenant between God and ourselves. Today there’s a fear of infection but there is no evidence to support this concern; we can drink from the chalice without danger to our health. If the blood of goats and bulls . . . sanctifies those who have been defiled . . . how much more will the blood of Christ . . . purify our conscience from dead works. For this reason Christ is the mediator of a new covenant, so that those who are called may receive the promised eternal inheritance, because a death has occurred that redeems them from the transgressions under the first covenant. Jesus’ blood never failed me yet; this one thing I know that he loves me so. He sang those same words over and over again. Gavin Bryars got his recorder and recorded the singing. When he went home he found the man’s voice was exactly in tune with his piano so he added an accompaniment to the voice and later some orchestration and it’s now on a CD. I’ve heard it twice on the radio and it’s very moving. The composer went back to where he heard the man but never found him again. Jesus’ blood never failed me yet; this I know that he loves me so. There’s a wealth of truth in those few words which could well summarize one important aspect of our theology of the Eucharist. Today’s readings have a lot of material for our meditation. They are rich in spiritual jewels. They remind us of the covenant of Moses and its fulfilment in the covenant that Jesus made with his blood given freely for love of us.